From Naaukeurige Versameling der Gedenk-Waardigste Zee en Land-Reysen (a series of accounts of famous voyages). 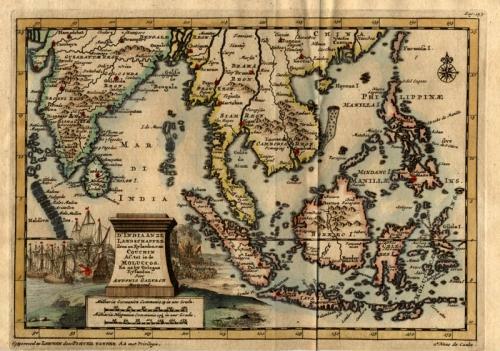 A map of Southeast Asia with India, Malacca, Philippines, Indonesia and Formosa. In the lower left is a fine title cartouche showing a naval battle and a siege of a town. Pieter van der Aa is highly thought of for the design and quality of his output. The map has a good and dark impression with a very decorative title cartouche. The lower margin has been cut close and the paper is slightly age-toned. Generally in very good condition. First state.